This post may contain affiliate links. Read the disclaimer here. With so many blog tasks to complete, it’s no wonder we waste so much time. Time on social media, Pinterest, Facebook, Instagram, then all of the backend stuff that goes into blogging that no one ever tells you about. Having a blog planner can keep you on task and focused. You’ve opened up Word, PowerPoint or Canva but you can’t make anything out of that blank screen. You’ve tried the templates or tried to look at other printables but you have no idea how to make things look pretty. You’re not a designer, you’re not creative, but you want your creation to look good, why else would anyone want to print it? 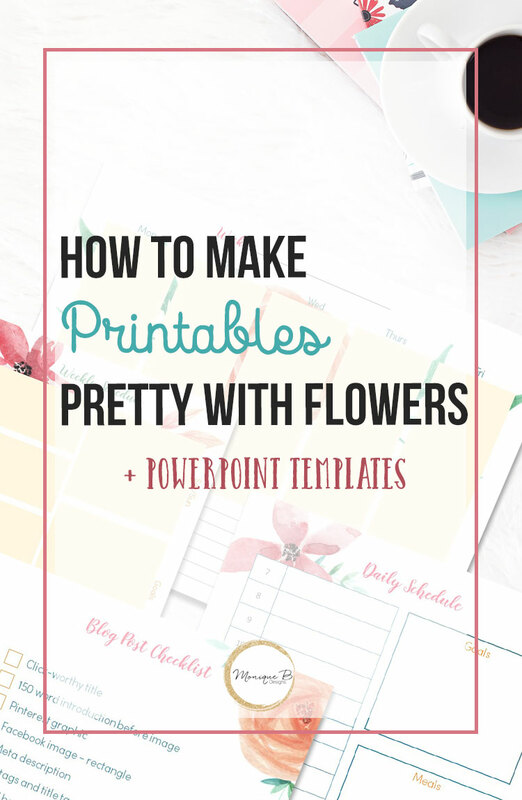 I’ve added these PowerPoint templates so that you can get started on creating your own printables right now. If you’re not sure how to use them, no worries, I did this Facebook live to show you how you could use watercolor flowers to beautify your printables. Hungry Jpeg is great site to get clip art and fonts. I grabbed a set of watercolor flowers as their weekly freebie. They have something new each week. If you missed the watercolor pack, they also have $1 deals and great bundles. Just a warning, my daughter walked in during my live as she was looking for something, totally real here guys, it threw me off a bit. The templates have the same layout as the planner, you have the freedom to change the layouts if you like or add in your own clip art. It just makes getting started super easy. Why create printables in the first place? You can use them as an email opt-in to grow your email list. Stop what you’re doing right now, you know email is important, stop worrying about Facebook or Instagram when you know email is the best way to connect with your audience. When you have loyal readers who love being on your email list, you can email them about your new post or affiliate offer and send them back to your site week after week. Need more help creating your first email opt-in? The DIY Printables for Bloggers course will be open soon. Learn everything you need to do from design to tech to start growing your blog and traffic.